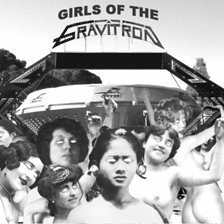 GET GALACTIC WITH THE GIRLS OF THE GRAVITRON! Our man in Denmark, the infamous JENS HELLROUTE, has come up with one of the weirdest bands ever to appear in Wormwood Chronicles (and that's saying something! )...the Memphis Metafeminists, GIRLS OF THE GRAVITRON! Jens encountered this unique mixture of shoegazy pop and noisy garagepunk while visiting GONERFEST 6 in Memphis, TN. Find out what this band is all about, their complicated history and their unusual perspective by reading Jens' interview HERE! KILL THE CLIENT "Set For Extinction"
JOHNNY LOKKE "Promises and Lies"
HAWKWIND "Blood of the Earth"
ATLANTEAN KODEX "The Golden Bough"
BLIND GUARDIAN "At The Edge of Time"